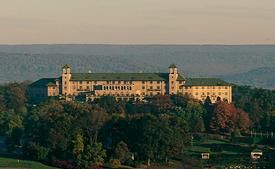 The Hotel Hershey has an imposing hilltop site. In front of the hotel are the Hershey Gardens, famed for roses (open seasonally.) Behind the Hotel are the Formal Gardens, outdoor pool, and lovely wooded hiking trails. The Hotel Hershey was built in the 1930's. During the depression years, Milton Hershey -- the man who brought chocolate to America, company founder and philanthropist -- started a building spree to provide jobs. At the back of The Hotel Hershey are the Formal Gardens, which make a nice backdrop for diners in the Circular Dining Room. Another view of the Formal Gardens. Kids will like that some of these pools are full of carp. The Fountain Cafe is a bright pretty restaurant, more casual than the Circular Dining Room. Kids definitely are welcome at dinnertime. Parents will like that the menu is sophisticated despite the casual atmosphere. Weather permitting, the Fountain Cafe opens its doors and serves guests on the terrace outside. The walls of The Hotel Hershey are lined with old photos, including this one of Milton Hershey: a fascinating character, more inventor than businessman, despite the fact that he successfully built the "Biggest Chocolate Factory in the World". Milton Hershey is probably holding one of boys from the orphanage he established with his wife (and the love of his life), Katherine: unable to have children themselves, they started an orphanage that Milton Hershey endowed with his fortune-- $60M in 1919-- after his wife's death. That orphanage is today the Milton Hershey School, which has educated thousands of financially needy kids. Read more. Hershey and his wife traveled extensively, and The Hotel Hershey is influenced by what he saw and liked around the world. The Spanish-style Fountain Lobby was the original check-in area for the Hotel Hershey; the reception area has since moved down one floor. The indoor (lifeguarded) pool, at the Hotel Hershey. An outdoor pool is open in summertime.Always check destination web site for updates! Like any self-respecting hotel these days, The Hotel Hershey has a major spa facility: in fact, the Spa recently doubled in size. Many of the treatments incorporate chocolate or cocoa beans in some form-- like, whipped cocoa bath. The Hotel Hershey's Spa has its own restaurant, the Oasis, and a Quiet Room where spa-ing moms can lounge with magazines, tea, hot cocoa, muffins and fruit at hand, while the kids are with Dad (unless he's at the spa, too) or at the hotel's Cocoa Kids club.